We are now in the final stages of the Meadows improvement project. All works are expected to be completed, and the site clear by Tuesday 30 April. On Wednesday 24 April the new traffic lights are due to be switched on. During that week, there may be timing changes and fine tuning of the new traffic lights. Once we are satisfied that the new lights are working correctly we will remove the temporary traffic lights. We would like to thank drivers in advance for their patience during the testing period. The new right hand turn lane to the A331 southbound will be opened to traffic on the 24 April. From Monday 18 March to Friday 19 April there will be weeknight disruption at the Meadows roundabout while new road surfaces are laid and road markings are painted. Lane closures will be in place between 8pm and 6am with clear diversion signs. Please drive with extra caution and look out for warning signs. The lanes which are closed will regularly change as the contractor moves around the roundabout, and there will be times where there are no road markings. Following the recently completed resurfacing works, the white lines and road markings will be painted from Monday 8 to Friday 19 April. The diversions will be short and will mostly direct drivers around the roundabout. 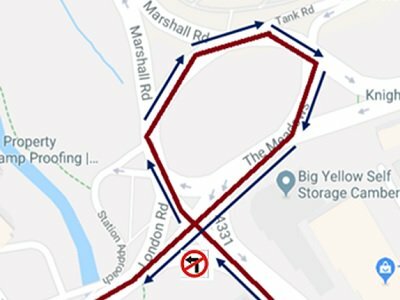 For example, traffic travelling to Blackwater heading northbound on the A331 towards the Meadows will not be able to take the first exit (left turn) to the A30 London Road, but instead will be directed around the roundabout to join the A30 as shown in the picture below. This scheme aims to reduce congestion and journey times at the Meadows roundabout near Camberley. To minimise congestion and delays during the main works, most activity will take place at night. We will be working Monday to Friday throughout the day and night. To keep up to date with the Meadows improvement project enter your email address below. We are committed to protecting your privacy when you use any of our services. Our privacy notice explains how we use your information and how we protect your privacy. Map showing details of the improvements to Meadows roundabout (A331/A30), Camberley.